On a continent where two countries are separated by Lutoni River and Central Mountains, the two countries, the Confederation of Roxche and the United Kingdom of Bezel Iltoa have been at war for over a century and now settled on a cease fire. Allison is a pilot in the Roxche air force and one day reunites with Wil, her companion from the House of Future, where they were orphans. Together they find themselves embroiled in an adventure in enemy territory to find a fabled treasure that will hopefully end the war and bring peace to both countries. From the same writer as Kino no Tabi, Allison to Lillia is a story about two young people finding their place in a complex, conflict-torn world, and their influence on those conflicts. The series is based on two manga: “Allison” and “Lillia & Treize”, which means the anime does divide neatly into two halves – the first story centered on Allison and Wil, the second centred on Lillia (who is Allison and Wil’s daughter). The connections between the two halves of the series work well – characters age, both visually and emotionally, and their youthful innocence disappears (particularly Wil – keep an eye on how he changes over the series – it’s one of the best examples of character development I’ve seen in recent years). What this series does incredibly well is show the suffering of what many would consider to be “the bad guys”. The strengths and convictions of characters who appear to be on the wrong side in the early episodes come through very well, and the suffering their families endure because they were on the wrong side is portrayed very well. It adds up to a world full of shades of grey, particularly in war where the history books are written by the victors. I debated long and hard as to whether this series was good or very good. If you enjoyed Kino no Tabi, then you’ll probably enjoy this. If you found KnT really boring, this series probably isn’t going to do much for you. All in all, I think it’s a damned fine series with some very interesting characters. Minotaur compares it to Kino’s Journey, saying if you liked that you’ll like this. I’m not so sure. 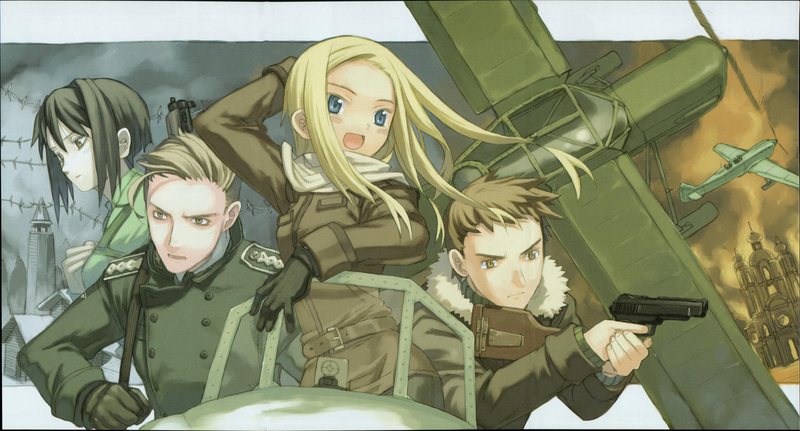 Though this is by the same author as Kino’s Journey, it takes a different approach. Kino was a zen-like ramble through unconnected scenarios where good and bad were hard to untangle. It was rarely Kino’s job to pick a side or take a stand, just to survive. In a real sense, the story contained no good or evil, simply the way things were. Allison and Lillia has a much stronger ongoing plot, a world that is developed in much more detail, and characters that belong to that world. It’s about having the courage to act, and also to hold to your own beliefs in the face of others’. The journey the main characters take is of discovering what’s necessary for the greater good. One of the first stages is moving beyond a distinction of friend vs enemy, and instead working to end/prevent the war. Subsequent stories deal with the consequences of actions, the uses and abuses of dishonesty, the balance of loyalty and revenge, and the sacrifices necessary to protect those you love. All these issues are seen from both sides, showing the honest views of those involved even in mistaken actions. At first I thought the series was shallow, because arcs were neatly dealt with in about four episodes, and there seemed to be clear good and bad guys. I was mistaken though, it simply takes time for the depth to emerge. In practice, the episodes mostly have a Tintin-like feel to them, with slightly unlikely coincidences placing our heroes repeatedly at the centre of the action. It’s only as the episodes build up that you see the characters develop. As Chris says, Wil’s development is complicated and impressive, and makes you glad that the story was willing to cover twenty years. There’s a distinct germanic theme, and not just in hair colours. Most anime war stories, that aren’t of the tribes and warring states type, are built on the position that Japan held in the two world wars: that the enemy is somebody a long way away, separated by an ocean (or space), who you don’t have much contact with. Roxche and Sous-Beil are different – they’re right next to each other, with a long history of interaction and war, as well as various subsidiary states. People move around, and their loyalties change and intermingle. It’s something you don’t usually see in anime. One oddness is the germanic tint to the accent of the singer for the ending theme. Particularly how he pronounced ‘wo’ as a german-sounding ‘vo’ instead of the more usual ‘uo’. Given the importance of machines, and particularly of planes, to the series it’s good to see that the visuals are flawless, with the CG integrating perfectly even against the simple character designs. They really look like they flow from the same pen, which helps in constructing a believable world.